Across the country, water drainage and sewage systems handle the water run-off from large-scale developments. As the scale of development increases in the coming years, the problem of surface water management will be greatly exacerbated. According to Michael Vaughan, Roadstone National Sales Manager Architectural Products, an undeveloped site has a surface water run-off of 10%, while a high-density development can experience a run-off of up to 55%. The challenge of managing surface water run-off is being met by an increased use of SuDS (Sustainable Urban Drainage Systems) or permeable paving systems. One of the key principles of SuDS are reducing water quantity thus dealing with surface water at the source reduces the effects of urbanisation and the impact of localised flooding. Michael Vaughan says Roadstone has been receiving an increased number of enquiries from across the country in recent times about Roadstone SuDs Aquaflow (SuDS) range of paving. Roadstone SuDs Aquaflow system allows rain to infiltrate through a permeable block paved surface into a unique sub-base before being released in a controlled manner into the ground or main sewers or watercourses. The system is capable of handling rainfall of 4500mm per sq m per hour. The water leaving the Aquaflow system is cleaned by filtration and microbial action and can also be stored in an integrated tanking system for secondary non-potable uses such as flushing toilets., watering soft landscapes and firefighting. A further advantage of Roadstone’s Aquaflow system is that roof water can be drained through an Aquaflow distribution tank directly into the sub-base. Roadstone can provide all the materials necessary to facilitate the design and construction of the Aquaflow permeable paving system. Michael explains that the Roadstone team like to get involved in a project as early as possible so the project team can avail of their design and technical expertise. 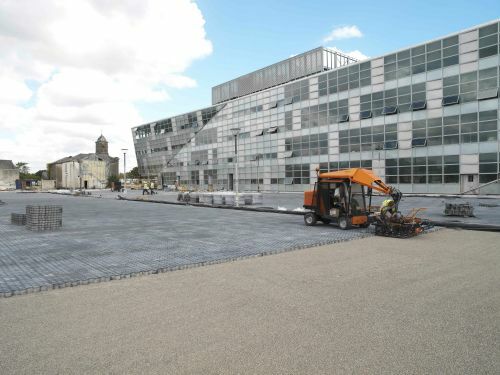 In 2005, Roadstone designed the Formpave Aquaflow system to facilitate a 21,000-sq m car parking space at Aras Chill Dara, the then-new Kildare County Council offices. Over the years, Aras Chill Dara reported no standing water on the car-park, even after major rain events, ensuring cleaner surfaces. Twelve years on the Aquaflow Paving is still performing its water management function.